My grandmother has the most wonderful collection of books. Or, she had the most wonderful collection of books, until pancreatic cancer rendered them orphans in July of 2017. My favorite subset of her collection resides on Hudson Avenue, across the street from the Harvey Cedars water tower on Long Beach Island on the New Jersey Shore. Since I was a child, I have run my sandy fingers through the spines of hardcover copies of exotic-looking tomes: Kenneth Anger’s Hollywood Babylon II, Seymour Hersh’s The Dark Side of Camelot, expensive-looking, slick art books about Man Ray and Diane Arbus and African sculpture. I spent almost every weekend of my life up until college thumbing through these books in search of knowledge, and then, during college, drunkenly caressing them, showing them off at parties I’d throw when my grandmother, the late Ann Nelson Wilkins, would leave me the keys to the castle. One volume I always ignored was James Michener’s thick-as-a-brick epic Texas. I was still a northerner then, unaware of Michener’s place in American literature and even doubly ignorant of his contribution as the namesake for The University of Texas’ MFA program for writers. In fact, before 2011, I knew very little of the university at all, other than fleeting statistics about a pair of running backs and a duo of QBs: Earl and Ricky, Vince and Colt. That changed in the fall of 2010, when I followed my girlfriend from Brooklyn to Austin, her hometown, without a job or a place to live, really, other than a spare bedroom in her father’s new home on the East Side of town. I’d miss the city and the sand and the ocean and the water tower, and of course, my family, but secretly, weirdly I’d miss my access to the books. On my first trip back to LBI in 2012, my grandmother noticed what had now become, if not a tradition then an obsession: my hours-long stroll through the books, my hands now clean with adult responsibility. “You know,” she told me, “that book was your great-grandmother’s. She went to UT.” She tossed this fact out as casually as she would inform me that there was macaroni salad in the fridge for me, or that I didn’t get all the sand off my feet before coming inside. I rarely heard my grandmother talk about her family. She did tell me, over the next few years, whenever I’d ask, that all she remembered about her mother’s time in Texas is that she went to UT, lived in the town of Paris, and once, as a little girl, was taken to the town square to watch a public lynching, an experience she referred to as “barbaric,” and that stuck with her for the rest of her life. I should have pressed her more, spent more time chatting with her instead of watching the New York Mets lose on her tiny television in the beach house living room with my brother as we pounded Budweisers in silence. I’m not alone in this regret, I assume, but in my family, investigating the past is like touching your tongue to a tooth you know has a cavity. It would be another six years before I made anything resembling a meaningful stride into decoding my family’s Texas history. Two years after I found out that I had Longhorn blood, I started working for the Alcalde magazine, and with that, got access to channels through which I had no excuse not to track down my great-grandmother. At first, I couldn’t find anything, so I bugged the Office of the Registrar, which let me know that she had attended beginning in 1913. Immediately, I grabbed at our complete stack of Cactus yearbooks. There it was, a tiny oval with my great-grandmother inside, among the other members of the Chi Omega sorority. Underneath, her name is spelled incorrectly: Elizabeth McQuire instead of Elizabeth McGuire. Still, even with this morsel of information, I only casually broached the conversation with my grandmother. Over the next couple years, I’d remember that I had Longhorn lineage only when asked about it, which would send me down another rabbit hole that generally left me empty-handed. What I really wanted to know was why she never graduated. I’d assumed that, like most women at the time, she left school to get married and raise a family. My grandmother died, and my direct connection to the information I then only casually sought died with her, which absolutely extols the virtue of promptness and should scare anyone away from letting family history die with the people who lived it. I became more serious about the project, partially shameful in my inertia and partially because the longer I waited, the more likely it would be that the scraps of information and apocrypha remaining would be lost to the sands of time. My procrastinating heart swelled with the need to figure this out, so I turned to our family’s amateur genealogist, my mother’s cousin Sarah. Even though Sarah is from my maternal grandfather’s side of the family, she had done extended deep dives into the other side of the family. She presented me with a wealth of information, but unfortunately, most of it represents my great-grandmother’s life before and after Texas. So I set out to piece together these faint traces of her life in the state and on the Forty Acres, and to make sense of it in relation to mine, before it vanished altogether. I often meet alumni who assume that since I consider myself an authority on UT (Do I? Well, maybe when it comes to live-tweeting football games. ), I must be a graduate. I used to launch into long-winded excuses that generally amounted to the bromide we all know and love that goes something like: “I’m not from here, but I got here as fast as I could,” which is technically a lie because I dragged my feet when my girlfriend (now wife) asked me to move with her to Texas. Eventually, I punted on that idea, because it’s lame and wordy, and distilled my Longhorn-ness (and, by association, my Texan-ness) into a quick, punchy comeback when asked if I attended UT. “Nope, but my great-grandmother did.” Who can argue with that? Sure, I’m an imposter, but she attended prior to World War I, which is long before you were born, so run along now, essentially. What I never think about is how abstract this concept is. Sure, the alumni I meet generally graduated some time during the 1960s or early ’70s, from what they consider a bygone era of UT—when it was cheap, the football team was transcendent, and the Charles Whitman Tower shooting loomed over all—my great-grandmother attended the university during what is sometimes referred to as the Fifty Golden Years, from its inception in 1883 until 1933. When UT was 10 years old—or perhaps 11—Elizabeth Archer McGuire, ’15, was born in Trenton, New Jersey, either on Aug. 17, 1893, or Aug. 17, 1894. Her tombstone in Cold Spring, New York, reads 1893, but Ancestry.com (and my uncle) says 1894. In 1900, her family lived at 61 West 11th Street in Manhattan, which has been the address of the Eugene Lang College of Liberal Arts at the New School since 1985. By 1905, when Elizabeth was 12, the family had moved to Essex County, New Jersey, and five years later, they were living on Second Street in the town of South Orange. In 1912, when Elizabeth was 18 or 19, her family relocated to Cooper, Texas, where her father took a job at an abstract company. The following year, likely due to proximity, she enrolled at UT. Elizabeth’s time at UT is spotty. On her enrollment form, she wrote that she graduated high school in 1912 in South Orange and that she was a member of the Methodist Church. Her report card, which contains the 1913-14 and 1914-15 academic years, is handwritten and tough to read, though I can deduce she took English, French, and geology, I think. It also looks like she wasn’t the greatest student, if I’m deciphering the report card correctly. Her freshman year is mostly B’s and C’s, with a couple A’s thrown in. Her sophomore year, it’s mostly C’s and D’s, with straight A’s in one class, labeled P.T. Campus looked considerably different then. The roads weren’t paved, because automobiles were a new invention. New Athletics Director L. Theo Bellmont, hired for the 1913 season, was at the cusp of turning Texas athletics into a superpower, but men’s teams played at Clark Field and the women in the basement of Old Main, hidden away from their male counterparts. The Tower was still two decades away from becoming a reality. In the fall of 2016, 51,331 students matriculated on the Forty Acres; in the fall of 1913, that number was 2,254. While it’s impossible to ascertain what my great-grandmother’s intentions were in pursuing a higher-education degree from UT, Wright provides some historical context for the pre-WWI campus makeup. I don’t have any clear indication of whether or not my great-grandmother came from loads of money, but her middling grades combined with her early exit from UT tell me that perhaps she didn’t—or her family didn’t—feel that a degree was of the utmost importance, compared to, say, just getting a job. It’s impossible to say exactly what her life was like. I don’t know if she attended meetings of the newly formed suffragettes group, or whether she had a boyfriend (or boyfriends), or if she attended football games at Clark Field, to watch the historic 1914 Longhorn football team demolish the competition by a composite score of 358-21. I don’t even know where she lived. In 1914, the Woman’s Building was the only female dorm on campus, and it is unlikely (though possible) that my great-grandmother lived there, as it only housed 85 students. Most other women lived in boarding houses off campus, not unlike the Scottish Rite Dormitory, though that wasn’t constructed until 1922. 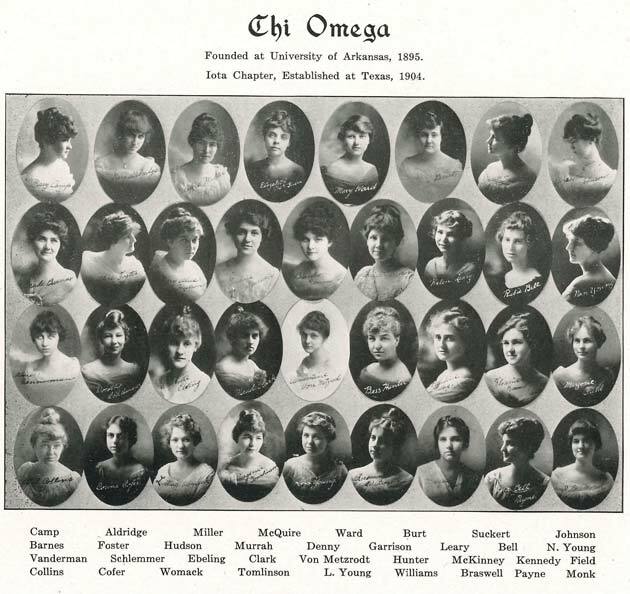 According to the 1915 Cactus, she pledged the Chi Omega sorority, but by 1916, she’s absent from the Chi Omega picture. 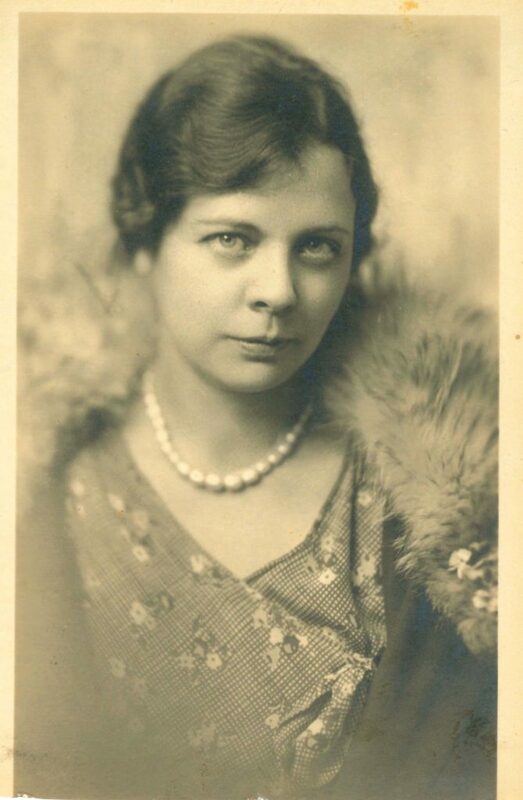 In fact, there is no record at all of my great-grandmother at UT after 1915. When I started digging through records, I found that Elizabeth was married to Russell Nelson (I have Nelsons on both sides of my family, including Ozzie, Harriet, Ricky, and, most fascinating to eight-year-old me, the eponymous twins) my great-grandfather, in June 1923. That’s eight years where she could have been studying at UT, but for whatever reason wasn’t. One theory I have is that she took the 1915-16 academic year off, and that she never returned to UT after the Paris fire of 1916. By this point, her address is listed as Cooper, Texas, a small town about 22 miles southwest of Paris, though her father, Albert McGuire, worked in Paris during various years. It’s possible she moved home to be closer to family, and when the fire started, eventually killing three people, destroying 1,400 buildings, and causing $300 million of damage in today’s dollars, she got stuck. In 1917, the Ex-Students’ Association put together a list of every current and former UT student. Elizabeth Archer Nelson is listed as a teacher. My mother tells me that Elizabeth and Russell didn’t have a ton of money, and that Elizabeth worked as a secretary at an insurance company, at least when she relocated to the East Coast. She had no idea that her grandmother was a teacher, though, in all honesty, it makes sense. My mother was the director of a child care center for 15 years, and my grandmother and I were two of her employees as teachers and teachers’ aides. Perhaps it runs down the maternal side of the family. Other than that, there are only two other documents that connect my great-grandmother to Texas. The 1920 federal census lists Elizabeth’s address as 260 South 22nd Street in Paris, Texas, and that she is a private school teacher. Then there’s the April 23, 1923, New York Times announcement of Elizabeth and Russell’s engagement. After the June wedding, Elizabeth and Russell moved to New Britain, Connecticut. Three years later, they had my great-uncle Bob, my grandmother’s older brother, and in 1927, Elizabeth came full circle, moving back to South Orange, where she had my grandmother in 1931. From there, Elizabeth’s story is sad, to me at least, and perhaps apocryphal. My grandmother told me that growing up, her parents were friends with an owner of the New York Giants, the major league baseball team that moved to San Francisco in 1958. My grandmother regaled me with stories of sitting in the owners’ box, of meeting players (“Mel Ott was cute!” she exclaimed once, with schoolgirl glee), and generally living out an affluent existence with her parents’ friends and their children. She never once mentioned that this was mostly a pretense. “There was all sorts of drama with [Elizabeth] and her husband,” my uncle David says. “She was a Republican and he a Democrat. He had been out of work for a long time, and he had a rented office space where he’d go and read the newspapers. He left her absolutely penniless.” Russell died in 1958, when my mother and her younger brother were toddlers. This is all news to me, and the more I ask, the more I learn. She babysat for my mother and uncles frequently. “She helped my mom out, but they didn’t have a close relationship. She used to drive my mother crazy,” my mother says. It’s all great information, but none of it addresses the problem I’d set out to solve when diving into my great-grandmother’s past. This entire time, up until a few short years ago, no one save my grandmother knew that my great-grandmother lived in Texas or attended UT. In the 1970s, when she was reaching her 70s, my grandparents placed her in assisted living in Atlantic City, before gambling was legal in New Jersey. My parents would drive down from Rutgers during the Christmas holiday to pick her up and bring her to Basking Ridge, where my grandparents lived. When gambling was approved in 1976, the property was sold and she had to move shortly after, to a facility in Neptune, New Jersey, that didn’t give her the same type of care she was accustomed to receiving. By then she had mostly lost her hearing, and had taken a couple of falls. In Neptune, she had a double occupancy room, and she complained that people were stealing her jewelry. My mother told me that she wasn’t just making this up, as the elderly sometimes do. “She felt really naked that she didn’t have a wedding band on, and I had this very simple silver band worth, like, nothing and I gave it to her,” my mother says. “She wore it until she died. I have it still. The level of care there wasn’t great. She started going in and out of the hospital.” She had nowhere to call home anymore. When Elizabeth died on Feb. 13, 1988, the facility waited more than a day to tell my grandmother that her mother had died. My parents didn’t let me go to the funeral, but one of my earliest memories is being 4 years old, walking through my grandmother’s red ranch-style house on Penwood Road in Basking Ridge, New Jersey, wondering why all these people I didn’t recognize were so sad. Do I feel like a Longhorn? Do I feel like a Texan? When you move to New York, according to the locals, it takes 10 years of continuous living within the five boroughs (and that’s being generous, the snobs usually turn their noses up at Staten Island) to become a New Yorker. Someone called me a Texan within a month of living in Austin. I was claimed, so to speak. The short answer is that I don’t know if I’ll ever feel like I belong here—on campus or within this state, and not for lack of trying on the part of everyone else who has attempted to make me feel like I’m at home. But this journey through the past has given me, if not an answer, some insight into what belonging really means, at least at this place. Maybe I’m not a Longhorn, and, given her short time here, maybe she never was either. But then, isn’t it one of UT’s unofficical credos to state that once one is a Longhorn, she is one forever? Elizabeth McGuire may not have been Kevin Durant or Farrah Fawcett, but she walked the same hallowed grounds as they later would, the same as I do every day when I stroll down San Jacinto. I find other similarities in our lives that are perhaps coincidental but read to me as parallel when I consider my own personal history. We both grew up in suburban New Jersey and came to Texas for family reasons. We were both at one point educators, and voracious consumers of literature. We both smoked Parliaments, though unlike my Nana, I quit instead of switching to Dorals. And at one point in our lives, we saw enough value in The University of Texas to spend some of our days here. At the end of my conversation with my mother, she seems out of anecdotes, until she realizes she needs to put a fine point on a character trait that connects the two of us. 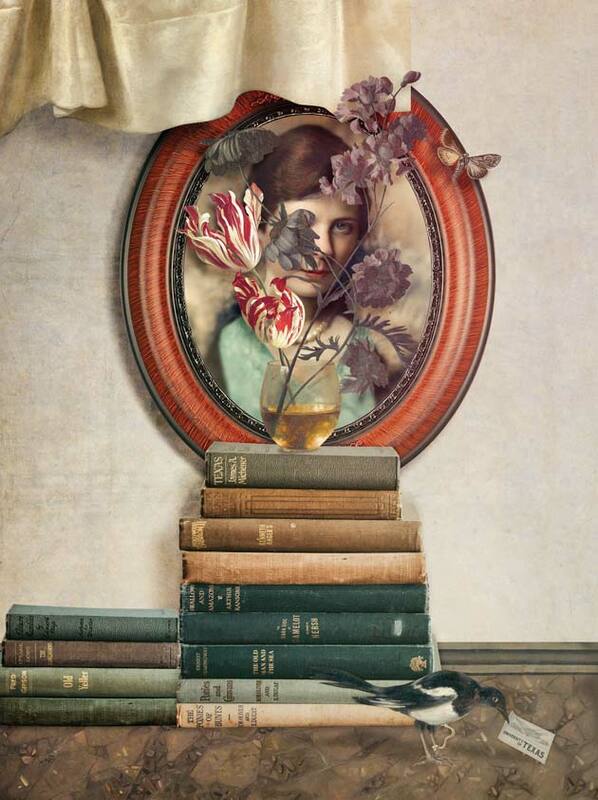 Recently my mother has noted, when she comes to Texas to visit, that I always seem to have my head in a book or a magazine while the rest of the world revolves around me. Like the Michener novel, written more than 60 years after she left, but which made her feel connected to the state and the university she left behind. A copy of Texas currently props up my computer monitor, a sin I am sure, but its height is beneficial. I’m looking at it right now, begging to be pulled out and consumed, so I can feel connected to her, and perhaps, by transitive property, to Texas, and to the university that sits like a jewel in the center of its crown.